The leaders, who change each year, possess a diverse range of skills and experience in outdoor and environmental education, youth work and conservation. At the beginning of the year, they receive extensive training, both formal and in-hosue, in Wilderness First Aid, Bronze Swimming and Swift Water Rescue, Four Wheel Driving, Safe Food Handling, chainsaw operation, navigation and how to live and work at Wollangarra for the year. Leaders essentially volunteer their time for a year in the mountains, working hard to provide great programs for hundreds of young people. Clare worked at Wollangarra in 2004, and has since gone on to study outdoor education, a graduate diploma of primary education and has a continued love for sustainability and the environment. Jay’s background is in youth development and journey based education. His first visit to Woll in 2016 reignited his passion for simple living and wild places. Elliot is five and loves dinosaurs, splitting wood and Wollangarra. Josh grew up in our nations capital and in the surrounding mountains developed his love of the outdoors. 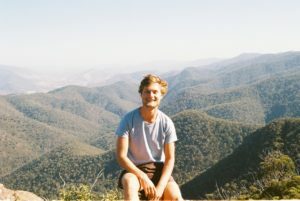 Although destined for a life of politics he quickly escaped to the beautiful south coast of NSW where he worked as a freelance outdoor ed instructor for a few yers. Dreams of adventure saw him pack off to China for a year of work, travel, hiking, language learning and great food. 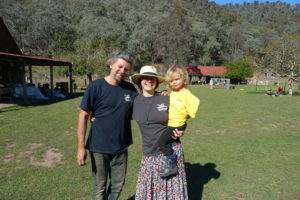 On his return to the land down under he rolled into Bermagui, working at The Crossing Land Education Centre for Dean and Annette Turner (former directors at Woll). They then sent him on his way down to our beautiful mountain home. He’s stoked for this year of living simply and passionately at Wollangarra. He loves hiking, swimming int he river, eating good food and sharing in the joys of life and the outdoors with young people. Before working at Wollangarra Fiora studied a Bachelor of Fine Art majoring in drawing and printmaking. During this time she delved into an exploration of connection to place through portraiture with drawing and print-making as her major study area. Fiora has also studied a graduate Certificate in Outdoor and Environmental Education and loves Working with young people in the outdoors. 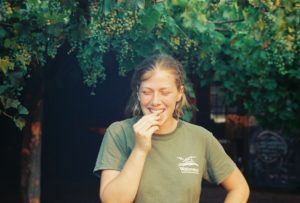 She is passionate about facilitating connection to place and environmental awareness through outdoor programs and loves a camp-fire sing along after a satisfying day in the bush. Fiora has a great love of walking which has inspired her to undertake many a journey on foot. She has walked the ancient pilgrimage paths of the Camino de Santiago and Camino del Norte in Spain, through the majestic Himalaya’s of Nepal and amongst the stunning lakes and mountains of northern Patagonia in Argentina. 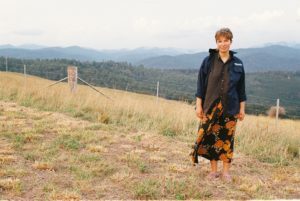 Fiora has also undertaken many bush walks in Australia including the 1000-kilometre Bibbulmun track that she walked solo in 2017. Alongside walking there is nothing Fiora loves more than a swim in a river, lake or ocean. Her daily swims in the McAlister River are keeping her energised and very content here at Wollangarra! Annabelle has been hanging around Wollangarra for a while now, and has finally decided to spend a year living and working there. She went through the Woll stages as a teenager onwards and was part of the Stage 3 Committee for a few years too. She was also on the Wollangarra Council prior to becoming staff this year. Annabelle loves hiking, bird watching, dancing, food and being a bit ridiculous too. Annabelle grew up on the coast in Barwon Heads, and since doing her Stage 1 program has been ever split between her love of the mountains and the beach. 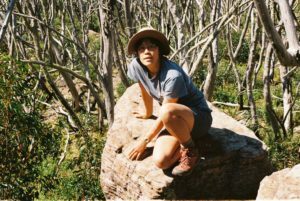 She studied Outdoor Education and Nature Tourism in Bendigo, and has spent the last few years working as a freelance outdoor and sustainability educator on the Surf Coast. She has also deferred her Masters of Teaching this year to come up to Wollangarra, and plans to complete it sometime after Woll. Jen grew up in Melbourne, but has spent the last few years living and working in Alice Springs, Phillip Island and Tasmania. Jen’s job history is like a box of assorted chocolates (70% dark, preferably). She has worked as a hiking guide on the Larapinta Trail and in Tasmania, a ranger at the Penguin Parade, a surf instructor on Phillip Island, and a circus trainer. Jen’s favourite places to hike in the world include the serene Tasmanian wilderness, the dramatic mountains of Nepal, the geologically significant “high coast” of Sweden and, of course, the rolling Victorian Alps. She is a keen gardener and in her spare time she enjoys hiking, rock-climbing with friends, juggling and reading. Jen first visited Wollangarra in 2016 for a work party, and the philosophy of the place struck a chord with her. 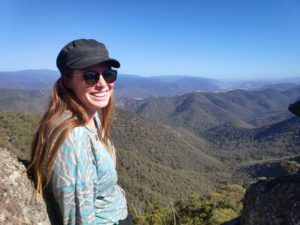 Having spent some time guiding adults on bushwalks, and with a degree in Environmental Science, she looks forward to sharing her passion for the environment with young people who visit Wollangarra. Catherine is 18 and comes from the summer town of Queenscliff. She began coming to Wollangarra as a young person in 2012 and has never looked back. Catherine thoroughly enjoys the Wollangarra lifestyle and combination of hard work, conservation and hiking. Before becoming a staff member at Wollangarra, Catherine studied conservation and land management at tafe, which she absolutely loved and highly recommends to anyone. In the future Catherine wants to pursue hiking, conservation, permaculture and organic farming. Another aspect to Catherine is her unicycling. She is what many may call a ‘mad unicyclist’. Last year she was the event organiser of the Australian Unicycle Nationals and also completed the 9 day Great Vic Bike Ride on her unicycle. So far, life at Wollangarra for Catherine has been amazing. Catherine’s biggest job areas are the gear store and vehicles. She is thoroughly enjoying living in the mountains and swimming in the river (almost) every day. Catherine is most looking forward to learning new skills and exploring the surrounding area on foot.